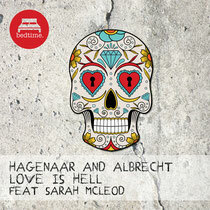 After a two years absence, Dutch/Austrian duo Hagenaar & Albrecht are back with their latest track, ‘Love Is Hell’, which sees them return to their distinctive ‘H&A’ sound with a rock intense vocal from Aussie rocker Sarah McLeod. Hagenaar & Albrecht rose to fame in 2008 with their global hit ‘What Would We Do’, broken on Pete Tong’s Radio 1 Show, then climaxing by them remixing the likes of Kesha, True Tiger, Professor Green, Wynter Gordon and multi Grammy winner Toni Braxton. In 2011 they signed to Atlantic’s dance imprint BigBeat, releasing the 2011 track ‘I Won’t Let You Down’, remixed by Albin Myers and bootlegged by Axwell. H&A have spent the last two years going it alone and exploring their own desires, with Patrick going onto remix the likes of Rudimental, Martin Solveig and the cream of the UK pop scene as well as gracing the Radio 1 airwaves on a regular basis. Alistair became label manager for Destined Records and set up shop building a label management company now controlling over eight separate labels, plus still finding time to produce a more underground sound on such labels as Stealth. They both continue to produce their radio show for the Radio FG syndicated out to over 100 other stations. It’s out October 7 on Bedtime Records.